Arthur Campbell Pochin was born in Chelmsford, the son of an electrical engineering pioneer. He was educated at Felsted School, Marlborough College and King’s College Cambridge. At the latter he applied for an officer’s commission in the army which was granted in December 1914. Arthur was wounded on the opening day of the Battle of the Somme in July 1916, but recovered to rejoin his battalion. He was again wounded in October 1916 but was killed by an exploding shell while being carried to the rear. Arthur’s home was in Moulsham Street. Having achieved the second objective a planned hour’s halt took place. However, by then seven of twelve officers in the battalion were out of action, and 20 year-old Arthur was one of four of them killed. Nevertheless an attempt was then made to reach and capture the third objective, Schwaben Redoubt. This ended in failure, brought to a halt by machine-gun fire from the north-west of Thiepval. Arthur’s battalion halted and dug-in some 100 yards in advance of the second objective - it had advanced the British front line by over a thousand yards. In addition to the officers the battalion suffered a further 170 other ranks casualties. The Commonwealth War Graves Commission shows 37 fatalities for the battalion on 26th September 1916. 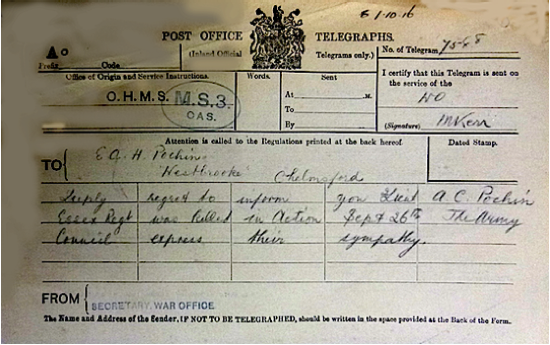 On 6th October 1916 Arthur’s father received the dreaded telegram advising him of his son’s death. 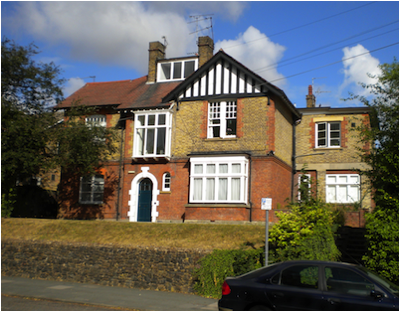 Arthur was born at 7 Albert Terrace, New London Road, Chelmsford on 31st January 1896, the only child of the electrical engineer Edmund Arthur Norman Pochin and Emma Jane Pochin (nee Sheldrake). 7 Albert Place is today’s 124 New London Road. Arthur was baptised at St. Mark’s Church, New Milverton in Warwickshire on 4th April 1896.
had been born in 1871 at Walton-on-the-Naze. Arthur’s parents had married at St John’s Church, Moulsham on 9th February 1895, at which time Arthur’s father was an engineer of Mildmay Road, Chelmsford, working for the electrical engineer Rookes Evelyn Bell Crompton who had established his firm, Crompton & Company in Chelmsford in 1878. While with Crompton’s Arthur’s father, who was a brilliant mathematician, invented the first Crompton-Pochin arc lamp, which was used to light most of the principal towns and cities across Britain. In 1900 Private Thomas Clements Parkyns Pochin, a cousin of Arthur’s father, was killed in the South African War. The following year the census found five year-old Arthur living with his parents and two servants at Westbrooke, a large house in Moulsham Street, Chelmsford between the Mildmay Almshouses and Southborough Road (later numbered as 118, pictured). At the time Arthur’s father was still employed as an electrical engineer, but had left Crompton’s to work for Marconi’s Wireless Telegraphy Works in Chelmsford. One of the servants in the household, Katie Emma Boulter, would eight years later give birth to Donald Hayward who was to lose his life in the Second World War. 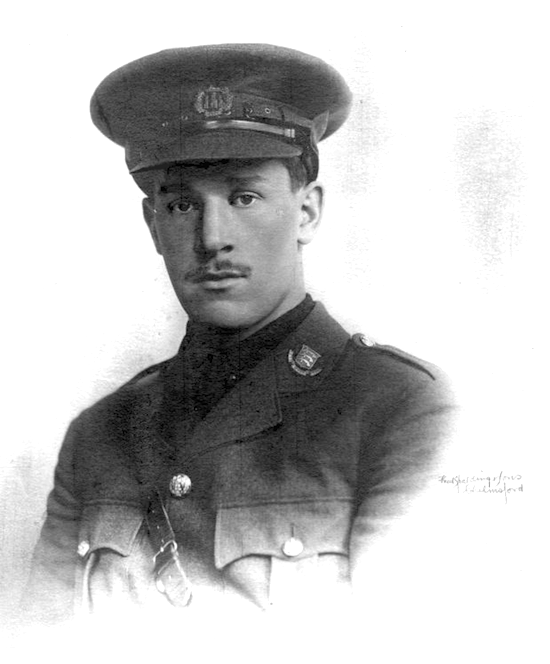 Arthur attended Felsted School as a junior pupil from September 1905. In his first term, ending December 1906, he studied Scripture, Latin, French, English and Maths, finishing third overall in his class. In the April 1907 term Arthur finished 10th in Scripture, 5th in Latin, 15th in French, 9th in English, 10th in History, 8th in Geography and 7th in Maths in a class of 16. In the exams in the July 1907 term he finished 11th, 3rd, 13th, 6th, 11th, 6th and 3rd out of 15 pupils in the same subjects respectively. The December 1907 term saw Arthur improve considerably in French, up to 1st in the exam, but continue to struggle in Scripture, finishing 13th out of 16 pupils in the exam - one wonders what his grandfather would have thought of that. In April 1908 Arthur studied science for the first time, only finishing 18th out of 22 students. His performance in exams improved in the July 1908 term with two first places and in his final term ending in December 1908 he was first in two subjects, second in two others and fourth in two others. He then left Felsted to continue his secondary education at Marlborough College in Wiltshire from January 1909 to 1914, where he was a prefect, and was recorded by the 1911 census. In June 1913 Arthur was reported to have won the modern school senior scholarship while at Marlborough College. The 1911 census also found Arthur’s parents still living at Westbrooke (number 118) Moulsham Street, along with two locally-born general domestic servants. Arthur’s father, then only 43, was described as a retired electrical engineer. His wife of 16 years had no occupation. Arthur was an Exhibitioner at King's College, Cambridge from 2nd October 1914. After one term there he applied for a temporary commission in the army for the duration of the war. On his application form Arthur gave his permanent address as Westbrooke and his address for correspondence as King’s College. He also stated that he could not ride. His medical examination, conducted at Cambridge on 10th November 1914, gave his height as five feet eight inches, his chest fully expanded as 37 inches, his weight as 140 pounds, and his teeth and hearing both described as ‘good’. He required glasses to get his vision to 6/9 in his right eye and 6/6 in his left. Without glasses his vision was 6/12 in both eyes. Arthur’s application was successful and in December 1914 he took a commission to become a Second Lieutenant in the 10th (Service) Battalion of the Essex Regiment. The battalion had been formed at Warley in September 1914 and was attached to the 53rd Brigade of the 18th (Eastern) Division. The 10th Battalion of the Essex Regiment went to France on 25th July 1915. The following month it went to Bouzincourt and into the line facing Thiepval Wood with the 51st Highland Division for instruction in the art of trench warfare. In August 1915 the battalion moved to Bray-sur-Somme in reserve. On 5th September 1915 the battalion travelled from Bray to the front line at Mametz to relieve the 6th Battalion of the Royal Berkshire Regiment. It was to stay in the area until the end of the year, spending time in the front line and in support in rotation. Fortunately it was a quiet part of the line. On 23rd September 1915 it was reviewed by Earl Kitchener in a field near Ribemont and on 25th October 1915 the battalion was inspected by King George V and President Poincare. After Christmas the battalion moved slightly further south in same sector and once again the tour was quiet. It then moved to Franvillers. Arthur landed in France to join his battalion on 9th March 1916. Between mid March and the early May the battalion took over line at Maricourt Wood. The second half of May and June were spent preparing for the forthcoming Somme offensive. On the evening of 30th June the battalion moved up Spring Avenue ready for the offensive which began the next day, with Captain Ridley leading C Company, and Arthur one of its three Second Lieutenants. 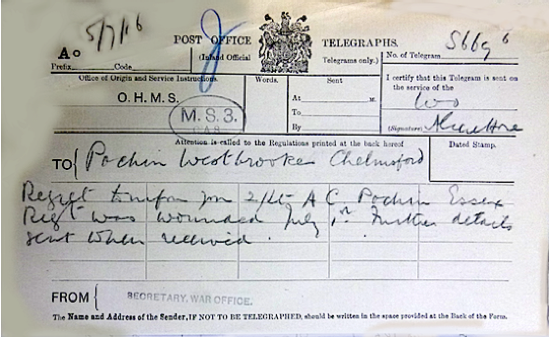 On 6th July 1916 Arthur’s father received a telegram confirming the news that he was wounded. Unlike the experinece in other sectors on 1st July 1916 the attacks involving Arthur’s battalion were relatively successful, and the 18th Division of which it was a part, managed to achieve all its objectives. Fighting went on to around 6 p.m. after which the battalion was ordered to consolidate and hold the Pommier Line, the 53rd Brigade’s second objective in the morning, which now formed the British second line. The 18th Division lost more than 900 men killed on 1st July 1916; The 10th (Service) Battalion of the Essex Regiment only lost 28 men killed that day. On 23rd July 1916 Arthur returned to duty at own special request although not too well recovered. The battalion was moved north and reinforced by drafts from 8th Essex Cyclists Battalion, some 250-300 seasoned Territorials “of good physique and for the most part Essex men”. On 25th August the battalion went to Chelers for more intense training for the next battle, for which Arthur’s battalion and comrades from the remainder of the 18th (Eastern) Division, were to take the German stronghold of Thiepval. It had been subject to a series of unsuccessful attacks by the Allies since the start of the Battle of the Somme on 1st July 1916. Arthur was entitled to the British War Medal and Victory Medal. Arthur’s father, who had trained at the Anchor Street Works of Messrs. Crompton and Company, and later became manager of the firm’s lamp department was awarded the M.B.E. in the 1919 New Year’s Honours for services in the war manufacturing rifle gauges. days later, with her husband and brothers William M. Sheldrake, Harry Daking Sheldrake and Robert Ireland Sheldrake mourners. Arthur’s father died at Westbrooke on 30th April 1949 after a short illness, aged 82. 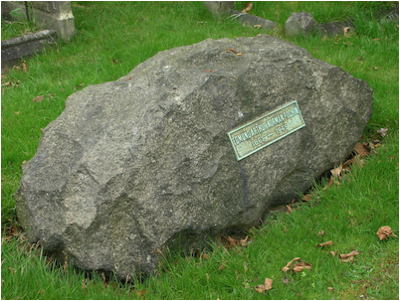 He was buried beside his wife on 4th May 1949. Their grave is today marked by one of the more unusual gravestones in the cemetery. Arthur’s father left a large estate valued then at £60,842 7s. Arthur has no known grave and is commemorated on the Thiepval Memorial, near Albert, Somme, France, on the Civic Centre Memorial, Chelmsford, and the Moulsham Parish Memorial, St John’s Church, Moulsham.